This month the Mark Morris Dance Group returns to Sydney and with them they bring their phenomenal program, Dance for Parkinson’s. Since beginning as a collaborative program between the Mark Morris Dance Group and the Brooklyn Parkinson’s Group in New York, Dance for Parkinson’s classes were first offered in 2001 and since then have reached 100 communities all over the world. The program has seen great success since beginning in Australia as an interactive workshop at the National Parkinson’s Conference in Brisbane in 2012 which provided the program incredible exposure. The first Australian teacher training workshops were offered the following year in Sydney and Queensland. Now the program has successfully developed ongoing programs in Brisbane, Canberra, Sydney and Melbourne with pilot classes in Adelaide, Perth and regional New South Wales, Victoria and Queensland. 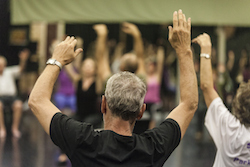 Dance For Parkinson’s returns to Sydney and is offering one free public class and also a 2-day Teacher Training Workshop this month coinciding with the Mark Morris Dance Group’s performance season at the Sydney Opera House. “Yes! It is very exciting to be holding the Dance for PD® Teacher Training at the Sydney Opera House on June 6 and 7,” says Erica Rose Jeffrey, Programme Coordinator for Dance for Parkinson’s Australia. “Many of the beautiful aspects of the Dance for PD® program stem from the emphasis on artistry and musicality and I feel these are a direct result of the program having its founding roots in the MMDG,” she adds. Jeffrey, who likes to think of herself as a “dance activist”, believes that dance can act as a positive tool for community, health and social change. She was first introduced to the Dance Parkinson’s program whilst living in California through colleagues at Berkeley Ballet Theater and their connections with the Mark Morris Dance group Dance for PD® Program. “I was struck by both the positive effect in the community, as well as the model of placing highly skilled artists at the center of the class. The dance class was valued as a an aesthetic and creative community experience,” says Jeffrey. “From my own dancer’s perspective, these classes are a beautiful and satisfying way to authentically share my own experience and passion for the art form in A way that also connects to community,” she says. 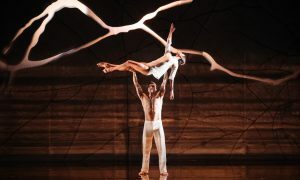 Queensland Ballet Dance for Parkinson’s pilot program and research. Photo Christian Tiger. These classes are open to everyone from persons newly diagnosed with Parkinson’s Disease to others with walkers and wheel chairs, family members and friends. These classes also allow dance to be used as a science and have very clear indicators of the benefits of dance practice. Recently the first research project on Dance for Parkinson’s Classes in Australia was held in collaboration with the Queensland Ballet, University of Queensland and Queensland University of Technology researchers with very positive results. There were increases in the group’s ability to maintain functional movement whilst multitasking such as walking and talking at the same time, less bodily discomfort, increases in emotional well being, confidence and communication. For more information on the FREE class, teacher training workshop and to learn more about the Mark Morris Dance Group season at the Sydney Opera House follow this link www.sydneyoperahouse.com/whatson/mark_morris_dance_group. Photo (top): Queensland Ballet Dance for Parkinson’s Pilot program and research. Photo by Christian Tiger.